This week, November 12-18, 2018, is U.S. Antibiotic Awareness Week (USAAW). 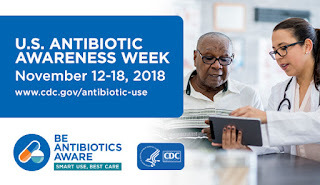 USAAW is an annual observance intended to raise awareness of the threat of antibiotic resistance and the importance of antimicrobial stewardship. Statistics show that up to 50% of all antibiotics prescribed for people are unnecessary or not optimally effective as prescribed. As the Centers for Disease Control and Prevention (CDC) notes, improving the way we prescribe and take antibiotics helps keep us healthy now, helps fight antibiotic resistance and ensures that these life-saving drugs will be available for future generations. For a list of USAAW activities planned by CDC for 2018 and numerous resources to help raise awareness of the importance of antimicrobial stewardship, click here. This week is also World Antibiotic Awareness Week, which the World Health Organization (WHO) states is intended to "increase global awareness of antibiotic resistance and to encourage best practices among the general public, health workers and policymakers to avoid the further emergence and spread of antibiotic resistance."